Some of the lots of cabinet card portraits of dentists I’ve recently obtained have included unidentified men. Working off the theory that these individuals may also have been dentists, I started looking through digitized histories of the University of Maryland Dental Department and the Baltimore College of Dental Surgery. Jackpot. I was able to match this unidentified gentleman to portraits of the founding Dean of the Dental Department of the University of Maryland, Dr. Ferdinand James Samuel Gorgas (1834-1914). Compare this image to one on page 400 of University of Maryland 1807-1907: Its History, Influence, Equipment and Characteristics, volume one, by Eugene Fauntleroy Cordell. By its subject’s dress, my portrait appears to be of earlier date than the published and widely reprinted portrait of the venerated doctor. Photographer James S. Cummins’ studio is known to have been located at 5 N. Charles Street ca. 1886-1887 (Kelbaugh, Directory of Maryland Photographers 1839-1900). Given that a number of the portraits of dentists I’ve acquired relate to the University of Maryland Dental Department’s graduating class of 1888, it again seems plausible that Gorgas had his portrait taken around that time. Dr. Gorgas’ biography and ancestry are well and widely known, so there is little need to belabor it here. He was born on 27 July 1835 in Winchester, Virginia to Mary Ann Smith and prosperous tinner and stove dealer John DeLancy Gorgas (b. abt. 1819, Md. ); grew up in Carlisle, Pennsylvania and attended Dickinson College here; graduated from the pioneering Baltimore College of Dental Surgery in 1855; was appointed Demonstrator there in 1857 and became a full professor in 1860. Gorgas earned an MD from the University of Maryland in 1863 and served the Union as an assistant surgeon during the Civil War. 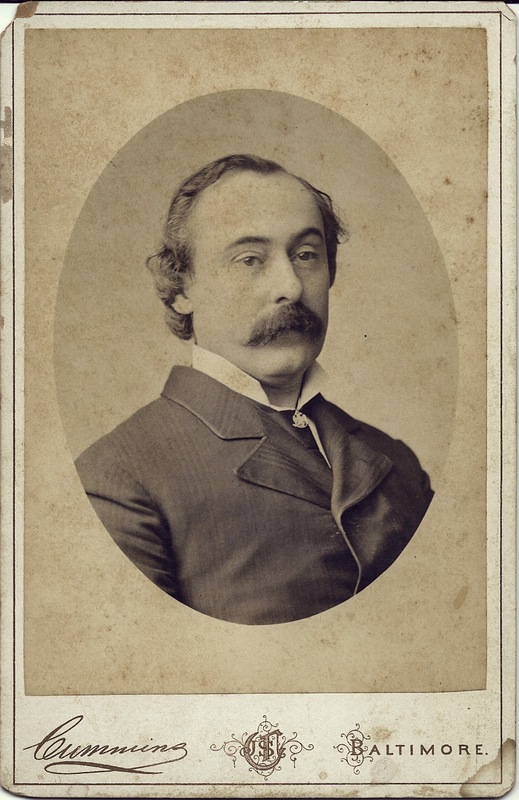 In 1865, he returned to the Baltimore College of Dental Surgery as Dean, departing in 1882 to become founding Dean of the University of Maryland Dental Department (now the School of Dentistry), a post he held until 1911. He wrote extensively on dentistry, revising seminal works by pioneer dentist Dr. Chapin Harris many times, and was one of the editors of the American Journal of Dental Science, one of the first professional academic journals on dentistry. He and his wife, Anna (Swormstedt) Gorgas (1835-1909), had four children, of whom I have identified three: Ellen, Dr. Lawrence D. Gorgas, MD (1861-1924) and Herbert F. Gorgas, DDS (1857-1958). Only their two sons survived to adulthood. Anna, who married Dr. Gorgas in Jefferson County, Indiana in 1855, was the daughter of Jefferson County, Indiana merchant Lorenzo Dow Swormstedt. Dr. Gorgas belonged to the Oriental Grand Lodge of Masons, a lavish 1866 Second Empire-style edifice that is now part of the Tremont Plaza Hotel, on St. Paul Place. The building, designed by Peabody Institute architect Edmund G. Lind and expanded by Joseph Evans Sperry in 1909, was rescued from demolition and lavishly restored as meeting and event space in the late 1990s. For many years the family lived on fashionable North Eutaw, and they may have attended Mt. Vernon Place Methodist Episcopal Church, Mount Vernon Place and Charles Street; the minister of that church presided over his funeral service. Ferdinand and Anna Gorgas are buried in Green Mount Cemetery; their two sons rest in Rosehill Cemetery, Chicago, Illinois. I am editor of an annual volume on Masonic history and would like to use this photograph to illustrate an article. How do I obtain permission?